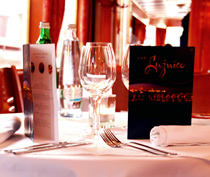 A timeless and unrivalled dining experience awaits aboard the Prague A La Carte Dinner Cruise. The evening is all about delightful food and drinks amid the warm ambience of Prague by night. The cruise begins with a glass of sparkling wine at your table, as a pianist sets the scene, playing soft background tunes. We then set sail, passing under Charles Bridge and through the city lock. Take in the sights from the unique perspective of the river. With the Old Town on one bank and the picturesque Lesser Town on the other, there are stunning views to enjoy of Prague Castle, Rudolfinum, Prague Parliament, National Theatre, Dancing House and Vysehrad. The price of the cruise includes a 3 course gourmet dinner with a choice of dishes for each course and waiter service, plus a bottle of fine wine per couple, and unlimited beer, mineral water, tea & coffee. The food is served leisurely throughout the cruise, allowing you time between courses to catch your breath. After a busy day this really is the time to wind down! The mahogany wood interior and warm soft furnishings give the boat a luxurious, timeless appeal. The cruise operates all year round, so the boat is heated in winter and air-conditioned in the summer. You can also go outside on deck at any point. With just 14 tables on the boat, each seating two to four people, advance reservations are crucial. A private table is guaranteed. And all tables offer good views of the sights. The Essential Seating Area includes a table in the main section of the boat, which has large windows running along both sides. The Gold Seating Area includes a table at the front/bow of the boat, which affords guests a panoramic view out the front, and there are premium wines. The Prague A La Carte Dinner Cruise is the most luxurious cruise in Prague. Waiter service makes it ideal for a romantic meal, but it is equally suitable for a group of friends, a family, or for a corporate event. -Prague Dinner Cruise & City Tour. -a private boat, exclusive to your group. -all group members charged the "Essential Seating" price. River cruise + Welcome drink + Gourmet dinner + Wine + Unlimited beer & water + Live piano.